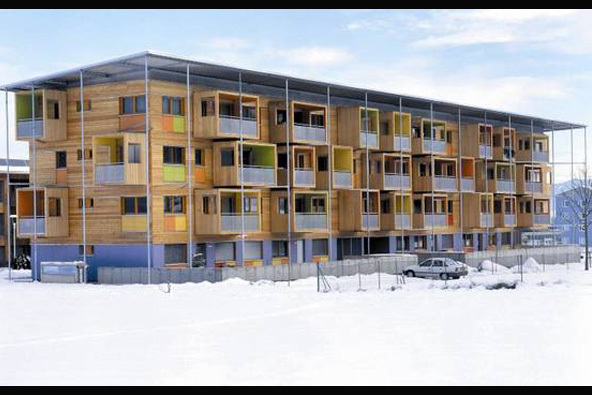 Judenburg, Frauengasse is the first four-story wood structure in Austria to take advantage of innovative new technology, including panelised construction and pre-fabricated laminated balconies. The structure provides 22 apartments, ranging in size from 800-950 square feet, retail space at ground level and underground parking. This type of housing is part of a new urban structure which was designed by MACK Architect(s) after winning an international competition. The design provides an open and flexible infrastructure by combining groups of dwellings, public/private open spaces, and walking streets. A series of allotment gardens run through the middle of the development connecting the site to its immediate past - the farmland just outside the city. The extensive timber flooring and joinery at Mills House provides a practical storage solution, with the aesthetic appeal of natural timber.